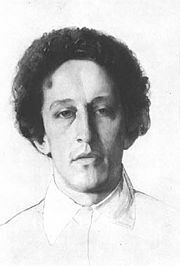 Alexander Blok Александр Александрович Блок, (November 16, 1880 - August 7, 1921), was probably the most gifted lyrical poet produced by Russia after Alexander Pushkin. He was the one of the leading figures of the Russian Symbolist movement, together with contemporary Andrei Bely. 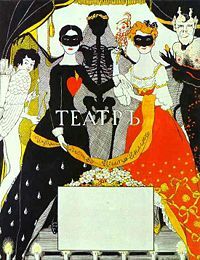 This era was also known as the Silver Age of Russian Poetry which represented the highest achievement in Russian poetry since the Golden Age of Alexander Pushkin, Mikhail Lermontov and Fyodor Tyutchev. Blok's most striking and important poem was The Twelve, which compared Bolshevik soldiers to Christ's disciples. Blok, to the surprise of his friends and colleagues, embraced the Russian Revolution of 1917 as the much anticipated realization of Russian messianism that developed in the 19th century. However, shortly after the revolution, those hopes began to be dashed with the outbreak of the Russian Civil War. Blok did not live to see its resolution. Blok was born in Saint Petersburg, into a sophisticated and intellectual family. Some of his relatives were men of letters. His father was a law professor in Warsaw, and his maternal grandfather the rector of the Saint Petersburg State University. After his parents' separation, Blok lived with aristocratic relatives at the Shakhmatovo manor near Moscow, where he discovered the philosophy of his uncle, famed Russian Romantic philosopher, Vladimir Solovyov, and the verse of then-obscure nineteenth-century poets, Fyodor Tyutchev and Afanasy Fet. These influences would be fused and transformed into the harmonies of his early pieces, later collected in the book Ante Lucem. He fell in love with Lyubov (Lyuba) Mendeleeva, daughter of the great chemist, Dmitry Mendeleev, marrying her in 1903. Later, she would involve him in a complicated love-hate relationship with his fellow Symbolist Andrey Bely. To Lyuba he dedicated a cycle of poetry that brought him fame, Stikhi o prekrasnoi Dame (Verses About the Beautiful Lady, 1904). In it, he transformed his humble wife into a timeless vision of the feminine soul and eternal womanhood (The Greek Sophia of Solovyov's teaching). Blok's lyrical output is generally categorized into three periods — 1898-1904, 1904-1908, with the third period overlapping from 1907-1916. (Terras, 428) The idealized mystical images present in his first book helped establish Blok as a leader of the Russian Symbolist movement. Blok's early verse is impeccably musical and rich in sound, but he later sought to introduce daring rhythmic patterns and uneven beats into his poetry. Poetical inspiration came to him naturally, often producing unforgettable, otherwordly images out of the most banal surroundings and trivial events (Fabrika, 1903). Consequently, his mature poems are often based on the conflict between the Platonic vision of ideal beauty and the disappointing reality of foul industrial outskirts (Neznakomka, 1906). Title page of Blok's book Theatre (1909). The image of Saint Petersburg he crafted for his next collection of poems, The City (1904-08), was both impressionistic and eerie. Subsequent collections, Faina and the Mask of Snow, helped augment Blok's reputation to fabulous dimensions. He was often compared with Alexander Pushkin, and the whole Silver Age of Russian Poetry was sometimes styled the "Age of Blok." In the 1910s, Blok was almost universally admired by literary colleagues, and his influence on younger poets was virtually unsurpassed. Anna Akhmatova, Marina Tsvetaeva, Boris Pasternak, and Vladimir Nabokov wrote important verse tributes to Blok. During the later period of his life, Blok concentrated primarily on political themes, pondering the messianic destiny of his country in Vozmezdie, 1910-21; Rodina, 1907-16; Skify, 1918. (During the ninteenth century, the concept of Moscow as the "Third Rome" was popular with Slavophiles. The reasoning behind it was that, unlike the West, Russia was like a "tabla rasa" on which God or destiny would "write" some great work for the sake of the world.) Influenced by Solovyov's doctrines, he was full of vague apocalyptic apprehensions, often vacillating between hope and despair. "I feel that a great event was coming, but what it was exactly was not revealed to me," he wrote in his diary during the the summer of 1917. Quite unexpectedly for most of his admirers, he accepted the October Revolution as the final resolution of these apocalyptic yearnings. Blok expressed his views on the revolution in the enigmatic poem, The Twelve (Russian: Двенадцать) (1918). Written early in 1918, the poem was one of the first poetic responses to the October Revolution of 1917. The long poem, with its "mood-creating sounds, polyphonic rhythms, and harsh, slangy language" (as the Encyclopædia Britannica termed it), is one of the most controversial in the whole corpus of the Russian poetry. It describes the march of twelve Bolshevik soldiers (likened to the Twelve Apostles who followed Christ) through the streets of revolutionary Petrograd, with a fierce winter blizzard raging around them. The mood of the Twelve as conveyed by the poem oscillates from base and even sadistic aggression towards everything perceived bourgeois and counter-revolutionary, to strict discipline and sense of "revolutionary duty." In a violent clash with a vigilante deserter, an innocent prostitute is killed by one of the Twelve, who appears unusually struck by the accident and later reveals to his comrades that he had been in love with that woman. However, after the others remind him that in these revolutionary times one's personal tragedies are nothing, the murderer regains his determination and continues the march. In the last stanza of the poem, most controversially, a figure of Christ is seen in the snowstorm, heading the march of the Twelve. The Twelve promptly alienated Blok from a mass of his intellectual followers. Accusations ranged from appallingly bad taste to servility before the new Bolshevik authorities and betraying his former ideals. On the other hand, most Bolsheviks scorned Blok's mysticism and aesceticism and especially the mention of Christ. He slid into a state of depression and withdrew from the public eye. The true cause of Blok's death at the age of 40 is still disputed. Some say that he died from the famine caused by the Russian Civil War. Others still attribute his death to what they ambiguously call a "lack of air." Several months earlier, Blok had delivered a celebrated lecture on Pushkin, whom he believed to be an iconic figure capable of uniting White and Red Russia. By all accounts one of the most important poets of the century, Alexander Blok envisioned his poetical output as composed of three volumes. The first volume contains his early poems about the Fair Lady; its dominant color is white. The second volume, dominated by the color blue, comments upon the impossibility to reaching the ideal for which he was striving. The third volume, featuring his poems from the pre-revolutionary years, is steeped in fiery or bloody red. Following in the footsteps of Fyodor Tyutchev, Blok developed a complicated system of poetic symbols. In his early work, for instance, wind stands for the Fair Lady's approach, whereas morning or spring is the time when their meeting is most likely to occur. Winter and night are the evil times when the poet and his lady are far away from each other. Bog and mire stand for everyday life with no spiritual light from above. 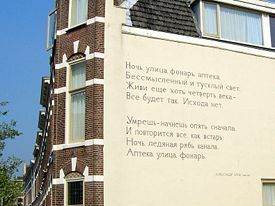 Blok's poem Night, street, lamp, drugstore on a wall in Leiden. A dull and meaningless light. Nothing will change. There's no way out. ↑ Encyclopaedia Britannica, 15th edition, 2006. Article "Russia". In Defense of A. Blok by Nikolai Berdyaev.